Hello and welcome to Day 6 of our February Rubber Die Release Showcase! On Wednesday (22 February) Whimsy Stamps released this month's rubber designs and new Shapeology dies. From then until 28 February the Whimsy Stamps DT and Special Guests are showcasing these fabulous new stamps and dies with a daily mini blog hop. 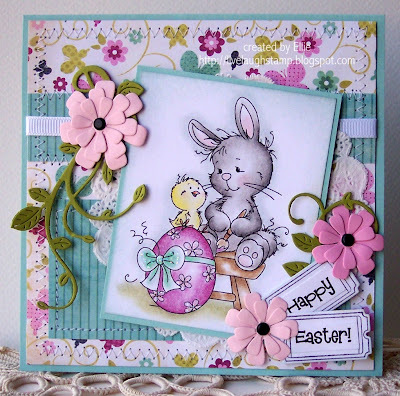 For today's showcase day I am showing you a card I made using the super adorable Easter Bunny Stamp by Whimsy's Sylvia Zet collection. This has got to be one of the custest Easter stamps ever! Of course I love all of Sylvia's adorable little creatures. It's been colored using derwent coloursoft pencils which I blended with baby oil. The beautiful papers are from a 6x6 pack by My minds eye lime twist. The tickets (without sentiment) are from Whimsy's set Celebrations Mini tickets, and cut out using Whimsy's mini ticket shapeology die. I computer generated the "Happy Easter". I really need to find a good Easter sentiment set. I embellished the card with some diecut flowers using the flower and leaf trio die by MFT. The beautiful flourishes were cut using Whimsy's Vines shapeology die. To finish it off I did some sewing and applied a little bit of glitter. To be entered into today's mini blog hop prize draw, be sure to leave a comment on ALL of the DT's posts listed below by 12.00PM EST tomorrow. All winners will be announced on the Whimsy Inspirations blog on 29 February. To take a peek at the rest of today's fabulous new release creations, please click on the links below...and don't forget to leave a comment for a chance to win. Thanks so much for stopping by today! And don't forget all these new goodies are available for purchase right now at the Whimsy Store along with all your other Whimsy favorites! Gorgeous, bright spring card! Love your colouring technique! An absolutely adorable card. Love all the details and colours. Your card is gorgeous! This little bunny is adorable! :) Hugs! what an adorable easter card love it. Those beautiful papers really complement this image. Lovely card! Your card is too cute. Love the coloring and your choice of papers. Great job!!! This card is beautiful!! I'm so ready for spring!!!! What a pretty card Ellie, it's full of fresh Spring colours. This is such a darling image and such a cute card. this is such a masterpiece with a brilliant colouring! Lovely flowers and vine swirls. Gorgeous card and wonderfully colored image! Super cute!!! The soft colours and cute details are a great compliment to this precious image!! What a beautiful and delicate colors. A wonderful composition. What a lovely card. TFS. Oh, this is so sweet, love your collors. It gives me the real spring feeling. Love your flowers. our card is so beautiful. I love the colours and the image is so cute. You colored the darling image wonderful! Great card. Oh Ellie, what an adorable card!! Love that bunny 'n chick image! Great job! I just love this stamp..and you have coloured it so beautifully, love the papers you have used, everything goes together so well love the ticket dies too..just ordered some of these..can't wait to use them lol!! Love your flowers too, really complements the card..
so very cute Ellie, love the sweet bunny and those delicate colours! I like the stamp and your colouring!! This is a Gorgeous card! I love your coloring and the pastel colors. Fabulous. Oh wauw this one is super-cute! The lovely papers match perfectly with the colored image. Absolutely fabulous!!! Oh my goodness this is so adorable! The colors are so spring like. Super sweet! Love the colours! Adorable card. That image is so cute and lovely cheery spring colours used. Wow Ellie what a beautiful card! this is an awesome card. love the colors, it is so pretty, the flower and i love those vines too. beautiful. This is so cute and great coloring!! Thanks so much for joining our "MAKE IT A TRIPLE" challenge at Shelly's Images! Please come back and join us again real soon!! Ellie I really really like your spring card. Love the bunny with the egg. Awesome coloring too! Wonderful colors and image on your Easter card! Thanks for playing along with our CropStop Challenge Blog. Cute card. Love the spring colors. Wonderful card, love you choice of PP, and thus the colors you colored your image, soft and pretty, just a wonderful job. Thanks for sharing your lovely talents. Absolutely adorable! I love all the pretty Easter colors and your coloring is amazing. Your card is so adorable. I will have get the Bunny stamp. Love your card very Beautiful. Love the image very cute. Thanks for joining us at Inky Impressions. Great colours and image for Easter, a sweet card. Thanks for sharing it with us at PanPastel UK this week. This card is just fabulous and simply perfect for the upcoming holiday of Easter! I love how soft and fun this card is! Thank you so much for joining us this week at the Inky Impressions Challenge! This is so gorgeous,the image is so sweet too,perfectly coloured! Thank you for joining in with our Spring Challenge over on Fairy Tale Challenge. I love this stamp and I love your card! Such great colors- just looking at this card lifts my spirits! wow! What a fabulous Easter card! I love that cute image! So beautifully colored! Gorgeous Easter Card!!! Love everything about it!! Thanks for playing with us at Crop Stop!! What a fabulous card! Thank you so much for playing along with the Delightful Challenge Design Team this week! Eine wirklich ganz süße karte ist das. Tolle Farben, tolles Motiv. Danke für Deine Teilnehme bei Fairy tale Challenge.Liebe Grüße. What a sweet card. I love your image.